Dodgers Receive 2017 NLCS Championship Rings « Sports-Rings.com – Blog | Like It Gold! The Dodgers officially thanked their players, coaches, and staff from last season by presenting the team with their 2017 National League Championship Series rings. The championship rings were designed and made by Jason of Beverly Hills. Jason of Beverly Hills is much smaller than Jostens, Balfour and Tiffany – the three companies that by far get most of the championship ring assignments. Jason of Beverly Hills is known to have made some of the more recent Los Angles Lakers World Championship Rings. “We’re proud to present our players, coaches and members of the Dodger organization with these one-of-a-kind rings as we celebrate our 2017 National League championship season,” said Dodgers executive vice president and chief marketing officer Lon Rosen. The NLCS championship ring was the team’s first championship ring since 1988, when they won the World Series and received World Series rings. This marks the team’s 22nd pennant in franchise history, which trails only San Francisco Giants (23) for most all-time in the National League. The Yankees for comparison, are around 40. 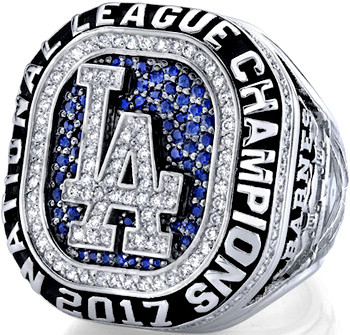 The focus of the championship ring is the team’s signature LA logo in white diamonds, which features Dodger blue sapphires behind it, and 2017 National League Champions written around the top of the championship ring. There is over 1 carat of white diamonds and more than 0.6 carats of blue sapphires in the Dodgers’ player ring. One side of the championship ring features a player’s name above an engraving of Dodger Stadium, with the player’s number in the silhouette of the stadium’s scoreboard. The other side of the ring has the Dodgers’ and “This Team,” the club’s 2017 postseason slogan. 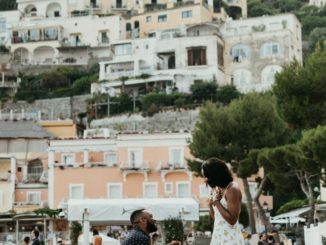 “I want to thank the Dodgers for commissioning us to design and manufacture their National League Championship rings,” said Jason Arasheben, CEO of Jason of Beverly Hills. Meanwhile as always, please remember, I buy championship rings. If you would like to sell your championship ring in complete privacy, please contact me.